Where to stay in Portoroz /Piran, Slovenia? 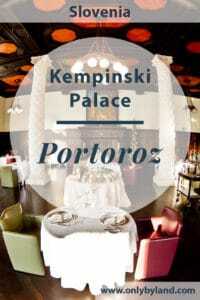 For the best rates book direct on the Kempinski Palace Portoroz website. For the latest events and special offers check out the hotels Facebook, Instagram and Twitter feeds. 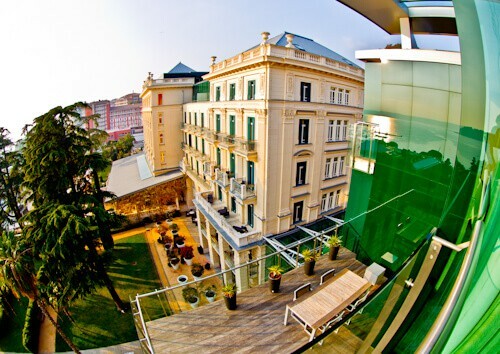 The Kempinski Palace is located on the promenade of Portoroz. You can walk to all the points of interest and restaurants of Portoroz from this location. There is a promenade that leads all the way to the Medieval city of Piran. The walk to Piran takes around 30 minutes and is especially beautiful during sunset. Kempinksi Palace consists of 2 main buildings. The historic wing, which is the palace built in 1908. The palace is a cultural monument of Slovenia. Alongside the palace is the modern wing which was built in 2008. The location of check in is between the modern and historic wings of the hotel. How many hotels have you been to that has an interior bridge? The bridge connects the historic to the modern wing. Whilst checking in be sure to ask the staff any queries you have about your stay. All the staff speak perfect English and will be happy to assist you. You may have questions about how to access the Rose Spa or about the onsite restaurants and bars. Staff will be happy to explain what to do in Portoroz and how to walk the promenade to Piran. The rooms are very spacious as you would expect from a 5 star hotel. A reason to choose the historic wing is so you can sleep in the famous palace. You will be sleeping in a cultural monument of Slovenia. Throughout the hotel there is complimentary super fast WiFi which extends to the rooms. If you’re traveling to Portoroz on business you can make use of the desk and wired internet. The bathrooms consist of walk in rainfall showers and a bath. An important decision you’ll need to make each day is whether to take a bath or shower! Be sure to book a room overlooking the Mediterranean. As well as the Mediterranean you’ll be able to view the beautiful gardens of the palace. Sunsets over the Mediterranean are some of the best in the world. When you step out onto the balcony of the palace you will experience a royal feeling. The modern wings offers chic rooms. For those who enjoy modern rooms in a modern building should choose the modern wing. Chic modern suites can also be found in this part of the hotel. Super fast complimentary WiFi is available in all rooms and throughout the hotel. The Rose Spa and swimming pools are located in the modern wing. A huge plus of staying in the modern wing is that you get a view of the palace. You may also enjoy a view of the sea. The alternative to a sea view is a park view. The balconies are more spacious on modern wing. Is it better to sit in the palace looking out or in the modern wing looking towards the palace? 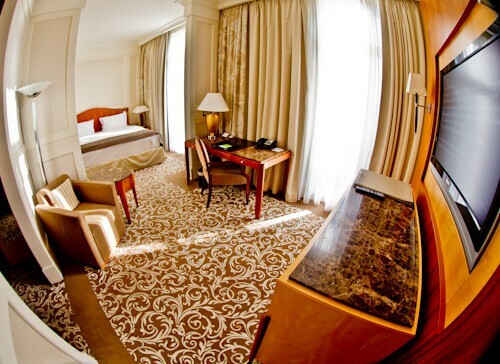 If you are visiting Portoroz as a group you may consider the presidential suite. It is the largest presidential suite in the whole of Slovenia. 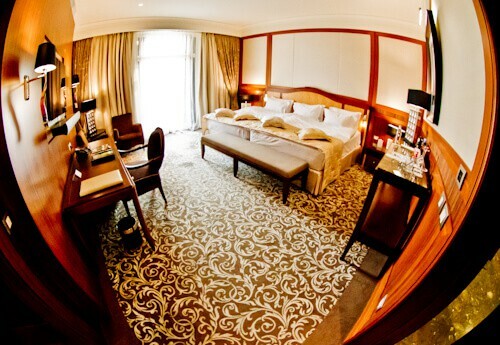 The bedrooms (above) in the presidential suite feature a double, double bed. There are several suites available in the hotel in both the historic and modern wings. 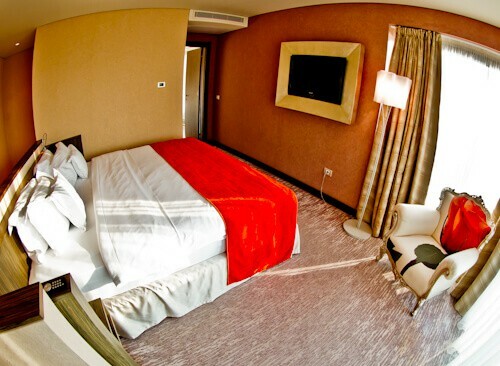 If you require a specific suite it is advised to book it as far in advance as possible. 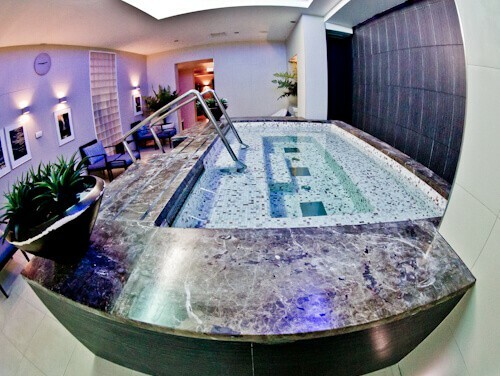 In the Rose Spa you’ll find a beautiful indoor swimming pool. There’s also a large outdoor pool which is just as beautiful. The Rose spa offers many different spa treatments. The signature treatment being the Secret of the Rose Ritual. This remarkable treatment is said to be the ultimate spa experience. Couples treatments are also available. 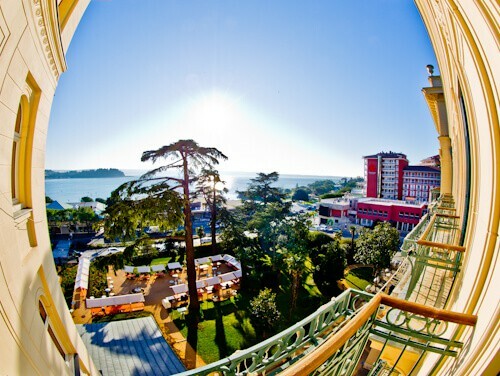 Those looking for a hotel with sauna in Portoroz will be more than satisfied at Kempinski Palace. 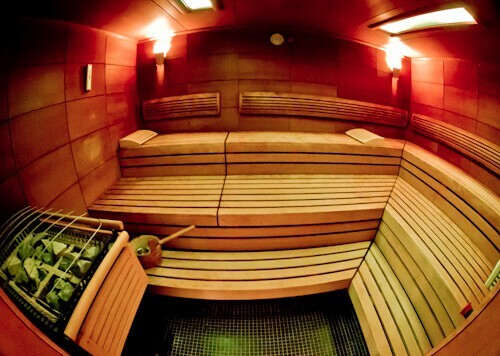 There are 3 different types of saunas available. You may choose between a Finnish, Turkish or Infrared sauna. With all the sauna options available in the Rose Spa you may require a cold bath to cool down. The Roman bath is conveniently located next to the saunas. Alongside the Roman bath is a relaxation area. You are encouraged to relax and unwind at the Rose Spa. A complimentary buffet breakfast is served in the elegant Crystal Hall. You may enjoy your breakfast inside or outside on the garden patio. The selection at the breakfast buffet will be one of largest you’ve ever experienced. There is a huge selection of fresh fruits, breads, sweet pastries, hot meats, cold meats, cheeses, jams, yogurts and cereals. There is also an egg station. Eggs are freshly prepared exactly as you want them and brought to your table. Have you been to a breakfast buffet before where you can freshly squeeze your own orange juice? The good news about the breakfast is that it’s served until midday everyday. This means you can relax and sleep in on your holiday. Restaurant Sophia is named after Italian actress, Sophia Loren. Sophia Loren has visited the palace. 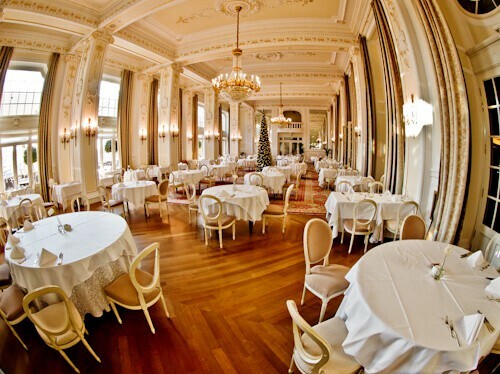 The elegant restaurant fits perfectly in the Kempinski Palace. 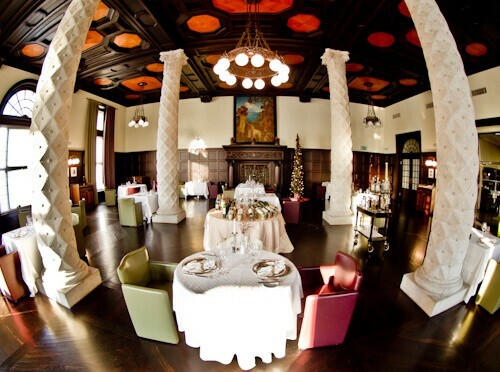 Whether you’re staying in the hotel or not, this is the place to fulfill your fine dining requirements in Portoroz. The Palace Club is a bar which serves drinks and snacks. There is a famous barman in this bar. If you order a drink he will always remember what you ordered. When you come back to Portoroz and enter the bar months later, he’ll know which drink to prepare for you. There is a sea view from the bar making it a perfect location for sunset cocktails. 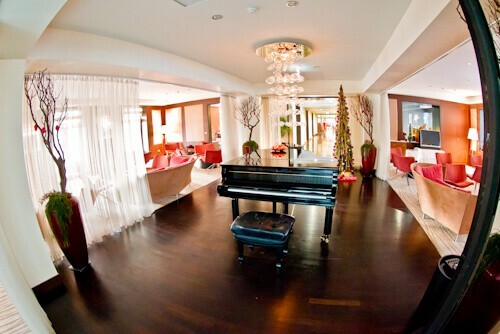 Visitors who can play the piano are encouraged to show off their skills. 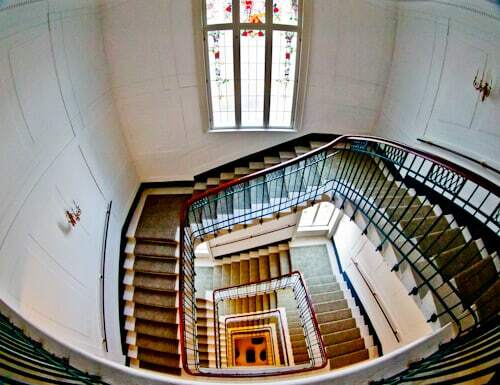 Whilst staying in the historic wing you must take the stairs at least once. The stairs are just one of many Instagram worth locations in the Kempinski Palace, Portoroz. 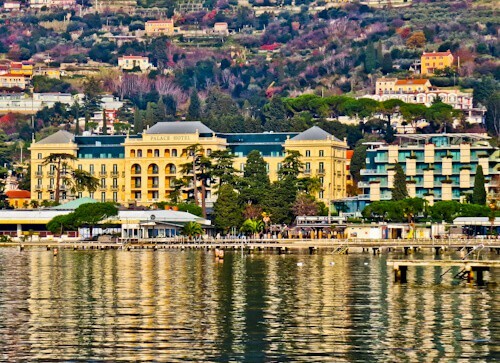 You could visit Portoroz and stay in the hotel the whole time. You would still go home with an amazing Instagram feed. Having said that, you must take the promenade walk to Medieval Piran. Make sure you order a drink from the bar. Then when you return to the hotel next time you can check if the myth is true. If the bartender really remembers which drink you ordered. Let’s also hope you want the same drink again! I can’t believe you stayed in an actual palace! The stairwell is certainly Instagrammable and it does seem tempting to not leave the hotel at all. The restaurants also seem quite attractive to dine in too. I’ve heard of Sophia Loren and she deserves a restaurant naming after her! 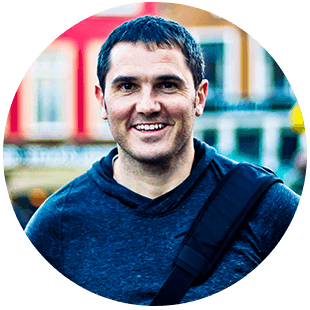 Wow Slovenia, an exotic country to travel to! I rarely find a post about Slovenia so I must say I don’t much about the country. I’m glad you included the Portoroz map in this article. I am not sure I would have afford staying at Kempinski Palace because look at that place! Is not called a Palace for no reason! I am grateful though to have seen inside the rooms even though only in a blog post! Wow, I have never stayed in a 5 star hotel. This looks absolutely amazing! I would definitely be in paradise. The inside bridge sounds super cool. I wonder how the bartender can remember everyone’s drink of choice.. I wish my memory was that great! Whoa! The place is stunning. As someone who loves to stay in hotels which have a historic significance, this is totally awesome. Its more than a century old! Wow! The staircase is too picturesque! I’d definitely go for a sea view room with balcony in the historic wing. I’ve stayed with Kempinski in Germany and had a wonderful time. The building here is so unique and I’m glad Kempinski are running it as it guarantees good service and facilities. I’ve heard Istria is one of the most beautiful parts of the world and the balcony view really shows that! 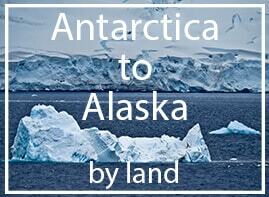 I am always looking for amazing hotels around the world. This is my kind of place. I can relax for hours at the Rose spa. I like the fish eye effect of your pictures. Which lens do you use for such shots? Hi Abhinav. For the fish eye effect I use the fish eye lens. 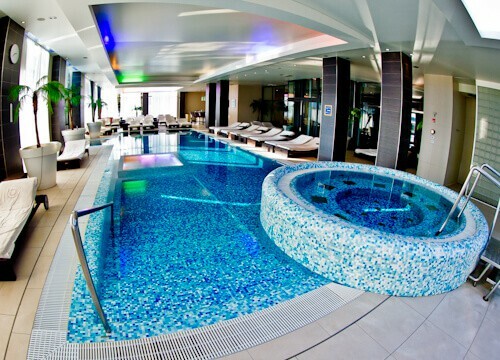 The Spa is something that I definitely need now. Don’t know when I will get to it and your picture and description make me itch for it now. I like the whole earthy, heritage feel of the hotel. A good job capturing them through wide angles, I like being able to see the whole room. I see there are 2 big choices to be made here. The first is whether to stay historic or modern. I think I’d stay modern with a balcony view of the sea and palace! The second choice would be whether to take a bath or shower in the room – then of course there is the huge spa downstairs. Breakfast until midday is genius! What a luxurious way to experience the coast of Slovenia! We stayed in Piran and loved it, but for this much luxury we might consider Portoroz next time. We would definitely take the historic wing over the modern one, though–it looks absolutely beautiful. Waking up to views of the Meditteranean seems like a great idea! 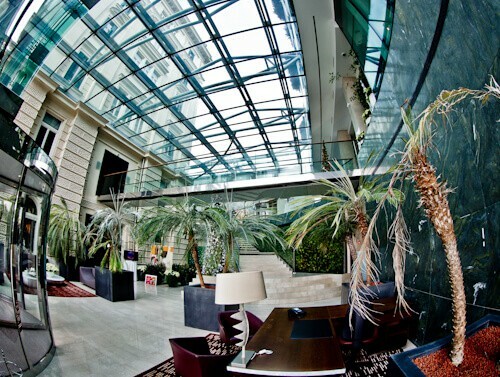 I’ve stayed with Kempinski in Germany – this one looks another level. I would choose the palace over the modern wing everytime! I must say the photo you took of the palace from the modern wing temps me to stay on that side though. The pool area looks wonderful – I would love to have that all to myself! Hi Georgia – if you go off season you should be lucky enough to have the pool to yourself!